(Sept 30,2009) John Tng Mathematical-Geometric Discovery Proofs Obama is the 666 Antichrist!!!!! The author of the article presented here has done a brilliant work of mathematical, geometric, gematric, biblical, and languages discovery that offers proof of the identity of Barack Hussein Obama as the 666 Antichrist of the Bible. Those readers that do not know the Lord Jesus Christ must re-examine their believes and learn the Gospel of salvation. He is the Truth, and our God. Many believe that the Biblical Apocalyptic Timeline was carved into the stones of the Great Pyramid of Giza. This may be so, but virtually no one pays any attention to another pyramid — much more intriguing and which offers highly precise end times information. You get better luck determining the year of the Second Coming in this pyramid than measuring the pyramid inches of the Great Pyramid. I am talking about the Genesis 1:1 Pyramid. The G11 Pyramid holds the clues to our escape and the Second Coming of Jesus. More than a year ago I was prompted by the Spirit to number the 2701 stones of Genesis 1:1 (Hebrew gematria 2701). I started numbering from the base and was intrigued by the 37th row beginning with stone 1999. With a stroke of luck (or Providence?) I decided to join the stones marked by JESUS (Greek gematria 888), CHRIST (Greek gematria 1480) and JESUS CHRIST (Greek gematria 2368). I was overjoyed when I found that the line joining 1480 (CHRIST) and 2368 (JESUS CHRIST) cuts through 2009! Bob Ware decided to number the stones from the capstone at the stop towards the base, just the opposite of the direction I counted. Bob’s red stones 888 (JESUS) and 2368 (JESUS CHRIST), when joined projected a line that ends on the year 2008. 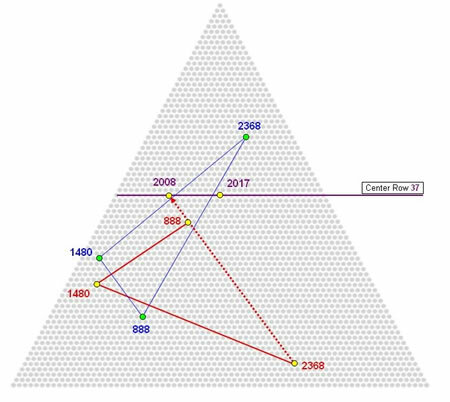 Clearly the triangulation indicates that between 2008 and 2009, a momentous historic event is bound to happen. I believe it has happened and is still happening even as I write, namely, the rise of the 666 beast and our soon departure. The small window is fast disappearing. I need not remind the readers where we are in history. We are moments away from seeing Jesus given the signs all around us. Prophetically, a tectonic shift of epic proportions occured in 2008. The precise date was Nov 5 when the son of perdition stepped out from the wings to take center stage in world politics and became the most powerful man on earth. Apparently, the date and the man are so central in God’s plan that they were edged into the stones of the Genesis Pyramid a few thousand years before fulfillment. The secrets of the ages will be revealed in a moment. The precision of the encoding will leave you in absolute awe of the omniscience and infinite wisdom of God! Barack Hussein Obama was elected the President of the United States in the early hours of Nov 5, 2008. He is the 44th president serving the 56th term of office. To see how God encoded this information, we must first understand how the pyramid stones stack up. Below is a blow-up of the left base of the pyramid showing the first four columns. Observe that the odd and even columns are offset to one another. Now take a look at the blow-up of the capstone showing the first four rows. Here comes the astounding part. Draw a horizontal line at the 56th row from the apex of the pyramid and draw a vertical line at the 56th column from the left base of the pyramid. Where do these two lines meet? Does the intersection throw light on the currernt US President serving his 56th term of presidency? Count it yourself column-wise: 1 + 1 + 2 + 2 + 3 + 3 + 4 + 4 + 5 + 5 + 6 + 6 + 7 + 7 + 8 + 8 + 9 + 9 + 10 + 10 + 11 + 11 + 12 + 12 + 13 + 13 + 14 + 14 + 15 + 15 + 16 + 16 + 17 + 17 + 18 + 18 + 19 + 19 + 20 + 20 + 21 + 21 + 22 + 22 + 23 + 23 + 24 + 24 + 25 + 25 + 26 + 26 + 27 + 27 + 28 + 9. The number of stones in the columns increases steadily reaching a maximum of 28 stones in the 55th column. The last column — the 56th column, only consists of 9 stones. Thus, the total number of stones is 793 — which just happens to be the English gematria of BARACK HUSSEIN OBAMA !!!!!! Observe that the line joining the blue stone 1480 (CHRIST) and the red stone 2368 (JESUS CHRIST) cuts through the stone 793 (BHO). It is reassuring to know that our counting is backed by the weighty testimony of the Lord Jesus. The coordinate (56, 56) — the intersection of row 56 and col 56, places Obama in the crosshairs. The year in which he won the election, 2008, is encoded FOUR TIMES in the design! Code #1: There are 28 stones in col 56. The number 28 is year 2008 without the zeroes. These 28 stones are divided by stone 793 (BHO) into 20 and 08 stones; combining the two numbers forms the year 2008. Code #2: The black vertical line that represents col 56 passes through the blue stones 2008 and 2009 on row 37! Both years are just as valid: Obama won the election 11-05-2008 and was sworn in 1-20-2009. Code #3: The union of the 56 rows and 56 columns of stones is 2008 stones !!!!!! This code is utterly shocking! Code #4: Counting vertically column by column, what are the chances that stone 2008 is found on row 56, the same row in which stone 793 (BHO) is located? Moreover, stone 2008 forms the eastern tip of a perfect inverted cross with stone 793 at its heart. It will be shown later that even the Hebrew and Greek gematrias of Barack Hussein Obama are also concealed in this inverted cross — an appropriate symbol of the antichrist — the upside down, values-perverting christ. Incredibly, even the date is encoded along with the year and the man. The plinth (trapezium) below row 56 consists of 57 + 58 + 59 + 60 + 61 + 62 + 63 + 64 + 65 + 66 + 67 + 68 + 69 + 70 + 71 + 72 + 73 = 1105 stones. Doesn’t the number 1105 represent 11-05, or November 5? The number 1105 is also the English gematria of PRESIDENT HUSSEIN (533 + 572 = 1105)! Obama won the election on Nov 5, 2008 but became the Leader of the Free World on Jan 20, 2009. Both dates were cast in stone millenia before the events by the all-knowing God. Nothing escapes God’s all-seeing eyes. Now that the final curtain has come down, the Genesis Pyramid can no longer hold back its ancient secrets. The number of stones to the right of col 56 is 1889, which can be written as the difference between the year 2009 and the inaguration date! For more links between 120 and Obama, please read Bob’s post today (link). The following code should put to rest any misgivings you may have about the validity of the two key dates in the G11 Pyramid. Counting vertically, there are 2461 stones ending on col 115 (11-5 or Nov 5); likewise, there are 2532 stones ending on col 120 (1-20 or Jan 20); in-between them are four vertical column totals: 2476 (col 116), 2491 (col 117), 2505 (col 118), and 2519 (col 119). Readers may recall the significance of the last number, 2519. It is the Greek gematria of the word COUNT in Rev 13:18 — the taunting verb that challenges any would-be solver. Readers who have read my last article on Rev 13:18 (link) may remember (I doubt it <grin>) that the totals 2519 (col 119) and 2532 (col 120) are in fact two Obama name triplets with added ‘US President’ title (below)! What is the significance of the six column totals between col 115 (Nov 5) and col 120 (Jan 20)? The sum of 2461 (col 115) + 2476 (col 116) + 2491 (col 117) + 2505 (col 118) + 2519 (col 119) + 2532 (col 120) = 14984 = 14191 (gematria total of Rev 13:18) + 793 (English gematria of Barack Hussein Obama) !!!!! The six column totals bracketed by col 115 (November 5) and col 120 (January 20) are proof positive that Barack Hussein Obama is the prophesied 666 beast of Re 13:18. Additional evidence provided by another column total basically seals the matter. 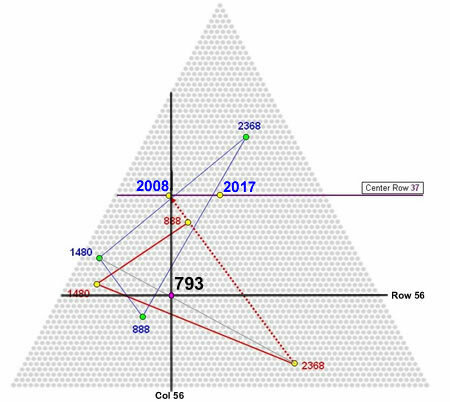 There are 145 columns in the pyramid; three of the column totals are Obama name triplets with title ‘US President’ (see above table): 2051 (col 95), 2519 (col 119), and 2532 (col 120). The gematria total of Rev 13:18 may be expressed as a triangle sum of these values! Hello, is anyone paying attention? There can be no mistaking that God conceals in the Genesis Pyramid the US President who serves the 56th term of office. Even the fact that Obama is the 44th US president was foreseen by the Almighty. Stone 793 (BHO) resides on col 56; from this column on towards the right of the pyramid, there are 44 remaining stones in the even columns! The number 44 may be counted another way: The remaining stones (after stone 793) on col 56 & row 56 are 8 and 36 respectively; their sum is 8 + 36 = 44. The two constituent numbers are the triangular roots of the beast number 666: The root (triangle order) of 666 is 36 and the root of 36 is 8! The number 44 is closely associated with 1318 — the scripture number of Re 13:18. The sum of all truncatable triangular numbers (1, 3, 6, 10, 15, 36, 66, 105, 153, 666; see link) and their associated triangular roots is 1318. This remarkable sum testifies to God’s purposeful coding of Re 13:18. Get this right: There are 44 numbers in the sum 1318! What you are about to read next is another ‘believe-it-or-not’. The English gematria of US is 300+100 = 400. The blue right-angled triangle below bounded between row 56 and col 56 is PRECISELY 400 !!! Stone 793 (BHO) is the intersection of row 56 and col 56. If we were to plot all possible intersections made by identical row and column numbers, what would be the resultant locus? 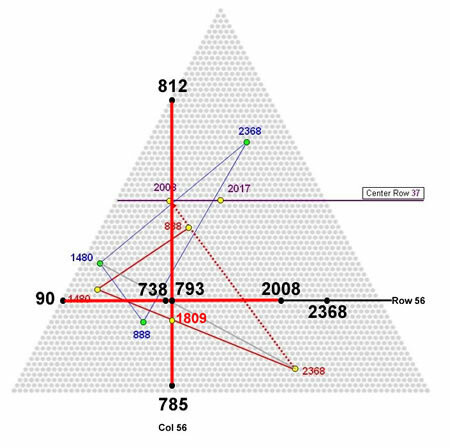 The first and last intersections occur at coordinates (37, 37) and (73, 73); thus the 37 intersections between them lie on one side (blue line below) of an inverted triangle at the heart of the pyramid surrounded by three satelite triangles with 666 stones each !!!!!! The English gematria of PRESIDENT is 533. 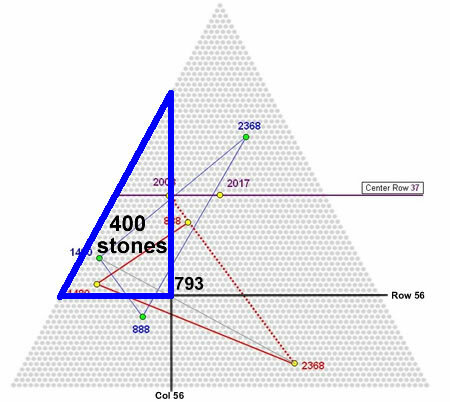 Astonishingly, there are precisely 533 stones filling (from left to right) the top part of the inverted triangle ending on stone 793 !!!!!! The man, his title, and two key dates of his rise to power are all there in the Genesis Pyramid without a shadow of a doubt. The heart of the inverted cross is stone 793 (BHO; English). The eastern tip of the horizontal beam is stone 2008, indicating the year of his rise. If we subtract the northern & southern tips from the eastern & western tips, the difference is a BIG surprise: (2008+90) – (812+785) = 501, the Hebrew gematria of Barack Hussein Obama !!! The difference of differences of the four tips is (2008-90) – (812-785) = 1891. 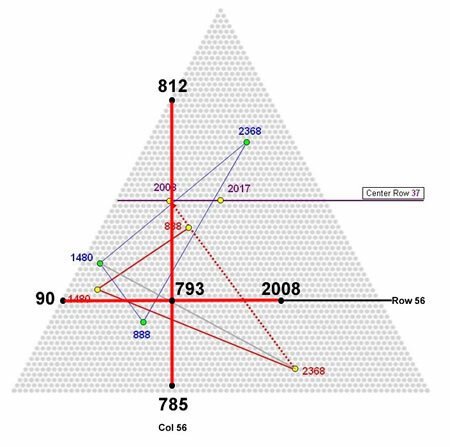 Kevin Heckle wrote about the significance of this number — the 61st triangle, in his article at this link. It is also the ASCII value of ‘barack hussein obama’ !!! As mentioned previously, the line joining the blue stone 1480 (CHRIST) and the red stone 2368 (JESUS CHRIST) cuts through stone 793 (BHO; English). What about the line below it joining the red stone 1480 (CHRIST) and the red stone 2368 (JESUS CHRIST)? It turns out this line cuts through the black stone 791, which corresponds to the red stone 1809 (below). The number 1809 is the Greek gematria of Barack Hussein Obama !!!!! The inverted cross triangulates on Barack Hussein Obama in three languages: 793 (English), 501(Hebrew), and 1809 (Greek)! Even the ASCII value of ‘barack hussein obama’ is hidden in the four tips of the inverted cross! The six stones in the inverted cross reveal the Encoder behind the codes: 90 + 2008 + 785 + 812 + 793 + 791 (red stone 1809) = 5279. This sum is the Name triplet of our Lord in Greek gematria — 888 (JESUS) + 1223 (LORD JESUS; Acts 7:59) + 3168 (LORD JESUS CHRIST) ! Along row 56, the stone to the left of stone 793 (BHO; English) is 738 — another Greek gematria of JESUS! 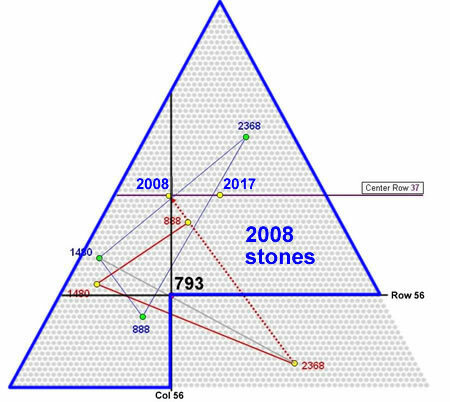 (See illustration above) Counting 27 stones to the right of stone 793 will land on stone 2368 — the Greek gematria of JESUS CHRIST! Thus, based on the vertical counting scheme, the horizontal line joining the black stones 738 (JESUS) and 2368 (JESUS CHRIST) cuts through the black stone 793 (BHO; English) ! Jesus triangulated on the Impostor-in-chief THREE TIMES: twice 793 (BHO English) and once 1809 (BHO Greek). 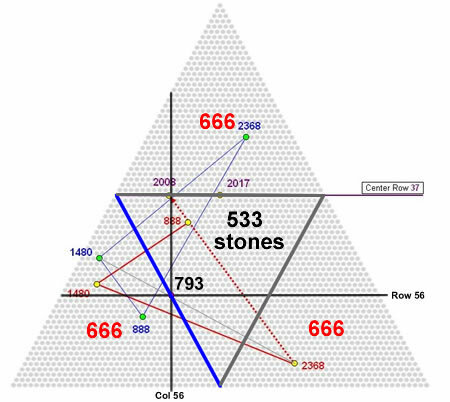 The location of the black stone 2008, not only frames a perfect inverted cross indicting Barack Hussein Obama (793) as the man of sin, it also divides the stones on the 56th parallel into 39 and 17 stones, thus forming a number 3917 which is the English gematria total of 1037 (US President Obama), 1154 (US President Barack Obama), and 1726 (US President Barack Hussein Obama) !!!!!! The supernatual precision exhibited by the Obama code in the Genesis 1:1 Pyramid leads us to only one conclusion — that Barack Hussein Obama is indeed the antichrist, the prophesied son of perdition, who is now seating in the hot seat, initiating the final moves that will launch the End of Days. This tells me Jesus is only a breath away! You are about to fly! (Sept 30, 2009) to Eric and Jimmy Lishman posts EARTHQUAKES!!!!!! A sign of the end times earthquakes!!!!!!!!!!!!!!! Last two days there were two posts in fivedoves.com about earthquakes and last night I went to the USGS site and was surprised to find the answer. Also one of the quakes hit 275 miles from Singapore where John Tng lives, quite an answer did he see. This past weekend in prayer and supplication to the LORD I asked for an indication of HIS coming to encourage all the Doves in our wait. “The world says it can identify the seasons, but the LORD says they are missing the mark! The world calls it climate change, but can’t they see that it is foretold as the birth pains of MY coming, surely the world cannot think that they have the power to change the climate as rapidly as it is changing! All power is given to ME and it is in MY hand”, said the LORD to me. O LORD what natural sign can I look into that even a sinfull world has no control over? I humbly asked. I went into the USGS site and collected all the earthquake data for quakes greater than M6 for the past 110 years and plotted it – my jaw dropped! Quakes averaged about 1-5 per year and a few years 10 all the way from 1900 up until 2001. From 2002 for each year until the end of 2008 the yearly average is 59 – WOW. I have prepared a graphic illustration(picture and 1000 words etc) and included it with this email for all to see. I’m not sure which page from the USGS site you got your earthquake statistics from, but this graph http://neic.usgs.gov/neis/eqlists/eqstats.html from that site shows that the number of earthquakes worldwide of M6 or greater spiked quite a bit starting in 2007 rather than in 2002. But so far, 2009 has only had half the number of > 6M quakes from 2008. There’s going to have to be a whole lotta shakin’ in the next three months if the annual trend is to continue. The speech of president Obama to the United Nations has put this country in the ranks of the enemies of the State of Israel. The fact that our Lord Jesus is an Israelite seems to have eluded him or he just plainly ignore it willfully. The article by Mercer posted here tells it all. To all you readers who love Jesus and know that Israel is the apple of His eye it will become obvious that we have placed our Nation with the enemies of our God. It falls into place that His chastisement is coming fast and furious. For decades the United States of America has been edging away from its only real friend in the Middle East. The relationship — which began tentatively at that brave moment when President Truman defied the ‘wise men” in his own administration and chose to recognize the newly born Jewish state; the relationship Israel worked tenaciously to strengthen in the ensuing years despite consistent opposition from within the State Department and other government circles; the relationship which since the Six Day War has become increasingly one-sided as America has chosen to cater to incessant Arab demands and press Israel into compliance — in the end it could no longer withstand the erosive onslaught it had weathered for so long. But things came to a head at the United Nations this week in a tale of two speeches delivered in front of some 140 world leaders who had come together in New York for the 64th session of the General Assembly. As they listened – joined by countless millions of others to whom the event was beamed around the world – these presidents and prime ministers, princes and kings witnessed the leader of the world’s most powerful nation contemptuously turn his back on one of the smallest. And they heard the elected and oh-so-despised leader of that little nation – which has been around far, far longer than the United States and virtually every other nation with delegates in that room – spell out with dignity and conviction the justness of his people’s cause. Betraying Israel with a kiss, Barack Obama expressed appreciation for the Jewish state, then denounced it as a nation of aggressive expansionists who were illegally occupying another people’s land. America will not tolerate Israeli settlements, he stated emphatically. And Israel’s presence in Samaria and Judea is an “occupation” that has to end. The situation between Israel and the Arabs was not the number one item in the American’s speech, which spelled out his vision for a new world order built on four “fundamental” pillars: Nuclear non-proliferation and disarmament, the pursuit of peace and security, the preservation of the planet and a global economy that advances opportunity for all. Obama spoke for 38 minutes, of which less than five – well into the speech – were devoted to the Arab-Israel conflict. The transcript is 61 paragraphs long with just five speaking to this issue. Yet there was no doubt that, to the president, the members of the General Assembly, and the press covering the event, this was the most important issue of all. Of the 12 ovations Obama received during the speech, fully half of them came in those few short minutes as he laid down his expectations. This man’s idea of “just” is totally twisted. The Jews’ presence in Samaria and Judea – the cradle wherein their nation was born, is an “occupation” that has to end. Twenty-four hours after Obama leveled his blow at Israel, Prime Minister Benjamin Netanyahu took the stand. He reminded his audience – as if he needed to – of the burgeoning threat to destroy the State of Israel in a nuclear holocaust. Recounting the disastrous outcome of Israel’s withdrawal from southern Lebanon (2000) and the Gaza Strip (2005), the Israeli insisted that his nation would not accept a withdrawal from the mountains of Samaria and Judea only to see a rocket-armed terrorist base set up overlooking the population centers in the coastal plain. But if the Arabs truly want to make peace, the people of Israel will make peace with them. Those Arabs – or their representatives – left the hall; unable to even hear an Israeli leader speak directly to them. Others – like the fervently pro-Palestinian British delegation – sat like stone; unmoved by Israel’s clearly-presented case. As the session came to an end – having also provided an uninhibited platform for the anti-semitic tirades of Iran’s Ahmadinejad and Libya’s Ghadaffi – Israelis took stock of the realities now confronting them. America – the nation they had long seen as a friend and ally – has effectively crossed the field to the other side – joining with all the other nations who refuse to recognize Israel’s claim to its biblical heartland, and who demand that Israel risk its very existence to appease the Arab world. Long ago the Almighty warned all those nations who come against Israel that the “Day” will come when He girds up His loins and in anger and fury will tread them out, in the winepress of His wrath. The two videos explain a judgement on america by God, a must see. This is a follow up on the excellent video by Rabbi Cahn on Sid Roth the how the US fit specifically in the 8-11 judgment. To the T I might add.. THis is the excellent video that Jan sent in. The US did exactly what Israel did when they were first given a judgment warning. The top one is a follow up. The follow ups have been removed by youtube because youtube sensors Christian warnings, especially the good ones. After listening to Rabbi Jonathan Cahn’s excellent word on equating 9-11 to the first judgment against the northern kingdom of Israel in Isaiah 9, I thought I would look up to see what might be next if we did not listen to the 9-11 warning. Like it says in the following scripture, our leaders have led us astray. So if the previous scriptures ring true, please watch the video..here and you will understand. There will be a much larger attack possibly preceded by an economic crisis. the end of days by BHO; again the article is by Joel Gallis and Dr.
(Sept 27, 2009) October 10, 2009 Start of Tribulation 7 Years, Rapture? A very interesting article relating to a precise count of the numbers in the Book Of Daniel. The site was first brought to my attention by KHOG from rita and all the dates seem to fit to a Jewish date. What do you think of it? TRIBULATION PERIOD TO BEGIN SOON? The Christian world view is that everything that happens in the world, happens by divine plan. The secular attitude or world view is that: “I don’t have to worry about what is going to happen tomorrow, next week or even next year. Que sera, sera, what will be will be” This is a life without godliness. There is great significance to Sir Robert Anderson’s book, “The Coming Prince” (written in 1895). It should not be underestimated by modern students of Bible prophecy, in that Anderson not only ably defended Daniel’s authorship of the Book of Daniel from the “scholarship” of unbelief of the Higher Criticism of his day, but he clearly established the historical accuracy of the fulfillment of the time oriented prophecy for the First Advent of the LORD Jesus Christ. The very fact that Anderson was able to demonstrate with mathematical accuracy the fulfillment of Daniel’s prophecy for the First Advent of the LORD Jesus Christ, indicates that the Father is completely pleased and willing that Believers spend time occupied with the study of and in anticipation for the Second advent of the Lord Jesus Christ. First of all then, does the Scripture give credence to those who believe a time frame may be calculated for prophetic events such as the Rapture of the Church, the beginning of the tribulation and the Re-birth & Restoration of Israel to true faith in the Lord Yahweh? Historically, the prophet Daniel calculated the length of the Babylonian Captivity from Jeremiah’s prophecy. There are two very important keys to unlocking the prophecies in the Bible? 1. The first and most important key to unlocking Bible prophecy is to recognize that almost all prophecy directly relates to the intervention of human affairs of one key player: Jesus the Messiah. 2. The other significant key to unlocking Bible prophecy is recognizing that the Hebrew calendar and Jewish festivals are central in understanding final day prophecies. To help us understand the importance of these two keys to unlocking Bible prophecy, were going to look at the Hebrew calender and it’s relationship to the different holy days, Sabbaths and festivals of the Lord. I believe that much evidence has been available to the Church, through the prophecies of Daniel and other such prophecies that we can come up with a credible time frame for the momentous events of prophecy that will close out this Church Age. Before we start looking at possible dates for the beginning of the tribulation and the coming of the Lord let’s discuss the Hebrew calender and it’s relationship to the seven feasts or festivals of the Lord. What is the importance of the feasts to Christians? First of all, we know from the study of scripture that when Christ came the first time He literrally fulfilled the first three feasts (Passover, Unleavened Bread & Firstfruits) to the very day. With that said, Bible scholars have asserted that the Church is the parenthesis between the 69th & 70th week of Daniel. So, for the last 2000+ years, the Lord Jesus Christ has been building His Church in this age of grace. (The Church that He has been building was absent from the first 69 weeks of Daniel and also, I believe, will be absent from the 70th week of Daniel). We are, seemingly, very close to the end of the Church age and the beginning of the 70th week of Daniel. Will the rapture happen before the tribulation (pre-trib) or in the middle of the tribulation (mid-trib) or at the end of the tribulation (post-trib). I’m an advocate of the pre-tribulation rapture but I am not going to give my arguments, here, for why I believe that. My assumption here will be that the rapture of the Church will take place before the 70th week of Daniel. I believe that following the rapture of the Church, the 70th week of Daniel will follow very close on its heels because the parenthesis (church age) will have been fulfilled and God can now focus back on the apple of His eye (Israel). Let’s look again at Daniel chapter 9, verse 27 or the beginning of the 70th week of Daniel. Daniel breaks the 70th week up into two halves with a division point being the “Abomination of Desolation”. Scholars say that the first 3 ½ years is known as ‘the tribulation’, while the last 3 ½ years is known as ‘the great tribulation’ or ‘the time of Jacobs trouble’. So that would be 1260 days followed by another 1260 days. This gives us some physical days that we can try to look for on the Hebrew calendar. But how does one determine where to start. I have in the past tried, unsuccessfully, to see if the festivals of the Lord fit in with the 2520 days (seven years) of the tribulation period. Plus an additional 30 days (Dan. 12:11) & and then another 45 days (Dan. 12:12). There are those that say that the 2520 days of the tribulation (or the seven biblical years) will start with the feast of Trumpets and end with the day of Atonement. Actually they need 2550 days to contain those two feasts in a seven year period (so they have to add the extra 30 days of Daniel 12:11). They say: “do the math and you will find out it works” Well, I did the math and I’m here to tell you it doesn’t work, period. There are always 8 to 12 days left over. This doesn’t cut it for our God is a precise God! When Christ fulfilled the first three feast days in His first coming he did not begin that particular week with the fulfillment of a major feast day. He began that week by fulfilling Shabbot Hagadol (Palm sunday). So, I have over the last year or so spent some considerable time looking again at the Hebrew calendar and trying to discover a possible start date for the 70th week of Daniel and not necessarily starting with a major feast day. I have come up with a scenario that seems to fit together nicely, for a possible tribulation time frame. Some might like to consider me a “date setter“, but I really consider myself a “date finder” — So here we go . . .
Tell the Israelites: The Festival of Booths to the LORD begins on the fifteenth day of this seventh month and continues for seven days. There is to be a sacred assembly on the first day; you are not to do any daily work. You are to present a fire offering to the LORD for seven days. On the eighth day you are to hold a sacred assembly and present a fire offering to the LORD. It is a solemn gathering; you are not to do any daily work. What really drew my attention to this particular day was that it started a seven year reading cycle (The question in my mind was why a seven year reading since this is also the length of the 70th week of Daniel). With this information in hand, it at least seemed to me like a good place to at least start looking at the possibility of the beginning of the 70th week of Daniel starting on Shemini Atzerat.If this first day was correct and this was the start of the 70th week of Daniel, then there would have to be many more dates that would come into alignment with this first one. I knew I would find out relatively quickly if there was anything to it. This year (2009) Shemini Atzerat takes place on October 10. It was my thought that this could possibly be the start date for the “confirmation of the covenant” or “Peace Treaty” (Israels Covenant with death). According to biblestudy.org : http://www.biblestudy.org/bibleref/meaning-of-numbers-in-bible/11.html the number 11 is the number which marks, disorder, disorganization, imperfection, and disintegration. And certainly this particular Shemini Atzerat (Tishri 22) could be double trouble. Who is behind this treaty? And now (2009) Javier Solana is the permanent Foreign Minister (High representative) of the EU. But let’s move on . . . If you count 1260 days (halfway point for the 7 biblical tribulation years) from Shemini Atzeret, October 10, 2009, you come to March 23, 2013, which is the day known as Shabbat Hagadol (The Great Sabbath). I spoke about this earlier as the day known to Christians as Palm Sunday. Jews, though, wonder why this day is called “THE GREAT SABBATH” Shabbat Hagadol? Jews, of course, do not recognize Jesus Christ as Messiah, so they do not understand the real reason for calling it “GREAT”. For believers this is the beginning of a great week in the history of the Church. The historical significance of this day for Jews, though, is highly intriguing. This special Shabbat commemorates a preparation for the original Pesach in Egypt. Shabbat Ha-Gadol (The Great Sabbath) commemorates the 10th day of Nissan, when the Hebrew slaves took the lambs that they were going to offer for Passover and tied them up outside their homes, to keep until they offered it on the 14th of Nisan (Ex. 12:3-6). According to tradition, this was a dangerous thing to do, because Egyptians worshipped sheep, but miraculously, instead of slaughtering the Hebrews, the Egyptians instead fought a civil war with each other over whether the Hebrews should be freed. This was known as the “war of the Egyptian firstborn”. The Shabbat prior to Passover is called Shabbat HaGadol. The source of the term is unclear as it is not found in the Tanach or Talmudic literature, though, in the middle ages a number of Authorities occupied themselves with explaining the origin of the term. One approach sees Shabbat HaGadol as originating with the special Haftorah (Torah reading), specifically the verse which refers to a day in the future which will be gadol, meaning great. Could this Shabbat Hagadol on March 23, 2013, (Nisan 12), be the start of that great and terrible day of the Lord in which Antichrist proclaims himself to be the passover lamb (God) and desecrates the temple by committing the abomination that causes desolation, spoken of by Daniel the prophet. COINCIDENCE! Also, Shabbot Hagadol is the only day (that I know of) in the Hebrew calendar that is not a date sensitive celebration (if it was it would always fall on Nisan 10th). It is a floating holiday on the calendar and always falls on the Sabbath proceeding Passover (check out WHY NOT OTHER YEARS on the menu bar). One possible reason that this holiday is a floating holiday is that Jewish tradition says that Miriam (Moses sister) died on the tenth of Nisan and so the “great” (gadol) day was moved to the Sabbath before Passover (afterall, how can you have a happy celebration on a day of mourning). Count out another 1260 days and you come once again to a Jewish day of celebration, Rosh Chodesh Elul or the first day of the month of Elul, September 3rd, 2016. What is the significance of this date? The days of Elul are called the days of “Divine forgiveness and kindness” These days of Elul are therefore the beginning of a special time of favor and conciliation. A time of mourning and repentance. The days of Elul were also known as “the days when the king is in the field.” Normally, in order to gain an audience with the King, one must go through a lengthy procedure. He must travel to the capitol city, arrange an appointment, and then get permission to enter the palace. Even when permission is granted is may be days or weeks before he is finally allowed to enter. When he does finally get to see the King, the audience is likely to be short and very formal. But once a year, the king leaves his throne to visit the various regions of his Kingdom. Now a king can’t just enter a city unannounced. When he reaches the outskirts of the city he is to visit, his entourage sets up a camp while a special delegation goes ahead to the city to make preparations, for the king’s visit. In the meantime, the King is in the field; relaxed and enjoying the early fall weather. He doesn’t stand on the same formality that he does when in the palace. The common folk are allowed to come out to greet the king and receive his blessing. Everyone is permitted and has the opportunity to approach the king. Read the last paragragh again! Could this be the day that Messiah comes back to earth and Israel mourns for He whom they crucified? Will they be restored to their former level of holiness at this time and will He now bring in “The Kingdom”? Interestingly enough, according to Daniel 12:11, there is 30 days added to the 1260 days of the second half of the tribulation period. So if we add an additional 30 days to our timeline, we move from Rosh Chosesh Elul (the end of the tribulation) to another great day for God’s people and for the world. For when you count 30 days from Rosh Chodesh Elul you end up on October 3, 2016, or ROSH HASHANA. This is the first day of the Jewish New Year. But this is also the day that the Messiah will be proclaimed as King of the Universe. The central observance of Rosh Hashana is the sounding of the shofar, the rams horn, which represents the trumpet blast of the peoples coronation of their king. The cry of the shofar is also the call to repentance; for Rosh Hashana is also the anniversary of man’s first sin. You would think if that if there is anything to what is being taught, then there must be some significance to this 1,335 day mentioned in Daniel 12:12. I know of no one who has ever come up with any real significance to the 1,335 day of Daniel. Is this beyond our finding out, afterall God’s ways are higher than our ways and His thoughts higher than our thoughts. Yet, there must be some significance to the 1,335 days or it wouldn’t be in the Bible. Interestingly enough, Cheshvan is the only month in the Hebrew Calendar that has no special holidays within it. This month, Cheshvan or the eighth month on the religious calendar (2nd month on the civil calendar) is a very interesting month. This month of Cheshvan, according to Jewish tradition, is reserved for the time of Messiah, who is said. will inaugurate the building of the third temple. So, my count ended up on Cheshvan 16 which is no particular day on the Hebrew calendar. So I thought that I might have finally hit an impasse. Interestingly enough, though, the very next day, or Cheshvan 17 was a day of great significance on the Hebrew calendar. It turns out that Cheshvan 16, 2016 (1335 day of Daniel) is exactly 100 completed years, to the day, from the Balfour Declaration. 100 years being the length of a generation as Abraham would of understood it for . . . Revelation 6:12 also says that the sun will be turned to black and the moon will be turned to blood (also look at Joel 2:31). The year 2015 will see two total solar eclipses and both of them will be on the two Jewish new years (Nisan 1 – civil new year & Rosh Hashana – religious new year). Also, the years 2014 and 2015 will see four total lunar eclipses (known as Blood Red Moons). What’s even more fascinating is that all four of these eclipses fall on Jewish Holy days (specifically major feast days. In both years they fall on the first day of Passover (spring) and the first day of Tabernacles (fall). Cheshvan 17 is the very next day, or as I believe, the possible beginning of the millennial reign of Christ. Is this scenario set in stone? ABSOLUTELY NOT! But isn’t it an interesting possibility! There are two important observations to be done about the article posted by Jim Bramlett today. The first is in the number 888 of identified active hate groups published by the SPLC (SOUTHERN POVERTY LAW CENTER). This # is the gematria value of Jesus which tells me more than one thing, He is in control, these are His people, they are under His eye and protection, and the enemy also knows all of this and is identifying them. The next thing to comment is the fear of the writer that Mr. Obama is to be the target for assassination of the same people that supported him. Let me remind the reader that Obama is the Antichrist and that according to the Bible he is to receive a mortal wound and survive. He will be alive at the end of the Tribulation and Jesus will throw Him and the false prophet alive into the lake of fire. All of you doves who are versed in scripture is about time that you realize the work done by John Tng and many other doves in identifying this man for who he is and start calling things the way they are. The church of Jesus Christ must oppose this man until we are taken out of the way, by Rapture or death. Soon darkness will fall upon humanity and the truth will be suppressed, so let us be diligent, firm in the Word and with faith in our Lord Jesus Christ act as soldiers of Christ our Savior and Redeemer. Another observation, Obama has already set his sites on the world political arena and is ready to ditch his base The United States of America like a snake shedding its skin when it no longer fits his body. O wow to the people of this country the snake Satan is about to give you to the wolfs for destruction. Below is an informative and sobering article from the Canada Free Press about Obama’s fall and what it might mean for America. If what he sees comes to pass, the blame will be put on conservative, patriotic Americans, and the media will see to it. The blame game is already in progress. The author believes Obama will soon be brought down by the same people who put him in power. Author JB Williams is a business man and a no-nonsense commentator on American politics, American history, and American philosophy. He is published nationwide and in many countries around the world. Obama has now become a noose around the neck of every American Democrat! dollars to win a lousy $400,000 per year job, and why? confiscate control of banking, insurance, energy and auto manufacturing. new owner of Government Motors and $13 Trillion in debt. the people took to the streets in protest. The people behind the puppet in our Oval Office did what leftists always do. interesting way of dealing with political liabilities. by people ready to lynch them in Public Square . messiah allowed to sit at the big desk with his finger on the red button. that he passes Article II requirements is getting louder. even the most fundamental questions. clearly losing the support of many Americans in that effort. Before the dissent gets any wider spread, they have to do something. currently chairs the NAACP, was named the fledgling group’s first President. veterans in vast numbers.”-Yes, those crazed military veterans. who believe their duty is to the constitution, not to elected politicians? martyr out of the mystery messiah.
. and once again, we see the report from the Southern Poverty Law Center. president who won’t even release his birth records, are responsible. finger-prints on the imaginary murder weapon. it better than the international leftist cabal. opposed to bankruptcy-by-communism in America ? made the list of 888.
words, “right-wing extremists” made the list. England ‘s press has bought that report hook, line and sinker. people stand up to stop his secular socialist global agenda. I am 100% opposed to the Obama administration and today’s Democrat agenda. conservatives opposed to his entire agenda. to happen to Obama or his family. senator would have fallen for the trap Obama finds himself in today. He can’t win. If he’s very lucky, he can only live to tell about it one day. risk from within his own ranks. health care. But the people are not going to allow it to go forward. who placed him in power, become saddled with his failures.